How to connect Davis WeatherLink software to YoWindow? 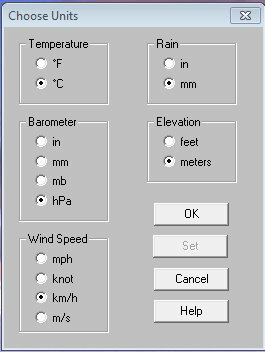 YoWindow can read the weather from WeatherLink through a file, composed in a special format - YoWindow weather file (yowindow.xml). You need to setup WeatherLink to generate yowindow.xml using a template. We provide you with 2 WeatherLink template files for YoWindow - for US and metric unit systems. 1. Choose the template that matches unit-system settings in your WeatherLink. Right click the link and choose "Save Target As" to save the file to disk. In a case your unit system is different, (like in Russia) you will have to adjust units in the template file. See yowindow.xml format documentation for the unit names. 2. Put the template file (.htx) on your hard drive wherever you like. Next you need to setup yowindow.xml generation. 3. Open Internet Settings dialog - (on the Menubar select <Setup><Internet Settings...> or press <ctrl+E>). There are 8 different profiles. We will use one of them to setup yowindow.xml generation. Choose any profile with the 'number of template files to transfer' set to zero. 4. Press <Configure> button under the profile, to open Profile configuration window. 5. 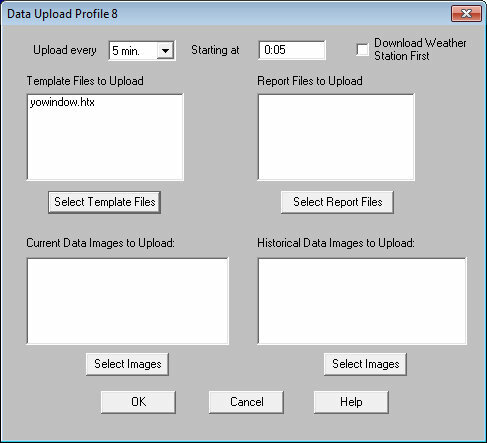 Set "Upload every:" to 5 minues to generate yowindow.xml every 5 minutes. 7. Select "Download Weather Station first" check mark. 8. Make sure all the other fields are empty. 9. Click "Select Template Files" button to add yowindow.htx template file. 10. Click "Add" button and locate yowindow.htx on hard drive. Click [OK] to close the window. All windows except the main WeatherLink window must be closed now. With these settings WeatherLink will start to generate yowindow.xml file every 5 minutes. 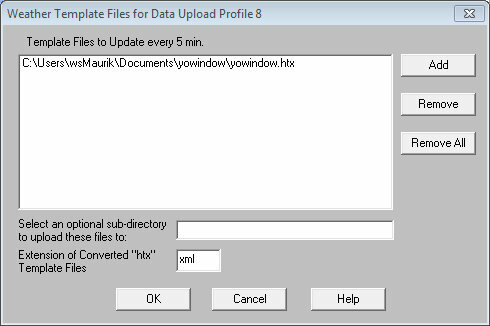 yowindow.xml will be generated in the same folder as the original template yowindow.htx. IMPORTANT: Make sure you have an access to your website ROOT directory. If you don't - you will not be able to connect WeatherLink and YoWindow widget. 1. Setup WeatherLink to upload yowindow.xml to your webserver.